In this article we will discuss the process of copying objects in java. There are mainly two types of copying available, deep and shallow copy. Shallow Copy: here if the field which is to be copied is a primitive type, then the value is copied else if the field which is to be copied is a memory address (or an object itself) then the address is copied. Thus if the address is changed by one object, the change gets reflected everywhere. Deep Copy: here the data is copied in both the situations. This approach is costlier and slower. Lazy Copy: This is a combination of the above two approaches. Initially the shallow copy approach is used and then checked if the data is shared by many objects and the program needs to modify an object, the deep copy approach is used. Use shallow copying when no encapsulation is required. Use deep copying when encapsulation is required. In shallow copy, a new object is created which contains the exact copy of the values in the original object. Shallow copy follows the bit-wise copy approach. In shallow copy if the field is a memory address, then the address is copied. Thus if the address is changed by one object, the change gets reflected everywhere. 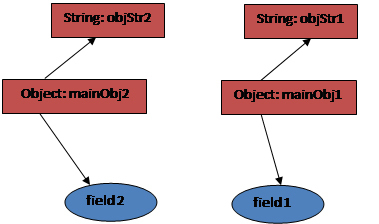 In this figure, the object - mainObj1 has fields field1 of a primitive type say int, and an object of type String When we do a shallow copy of mainObj1, mainObj2 is created with field2 of type int which contains the copied value of field1 but the String object in mainObj2 - still points to objStr itself. Since field1 is a primitive data type, the value of it is copied into field2. But since objStr is an object, mainObj2 is pointing to the same address of objStr. So any changes made to objStr via mainObj1 get reflected in mainObj2. System.out.println("Original Object: " + stud.getName() + " - "
System.out.println("Cloned Object: " + clonedStud.getName() + " - "
System.out.println("Original Object after it is updated: "
System.out.println("Cloned Object after updating original object: "
+ clonedStud.getName() + " - "
Here we see that the value of the field name gets changed after the copy operation but the value of the object subject remains the same as it is pointing to the same memory address. Hence the subject for Jonathan becomes 'Physics' where as it should be 'Algebra' as the object for SubjectVO in the cloned object remains unchanged. In deep copy, not only all the fields of an object are copied, all the dynamically allocated memory address which are pointed by that object are also copied. 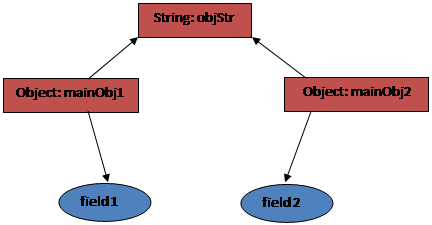 In this figure, the object mainObj1 has fields field1 a primitive data type say int, and an object of type String When we do a deep copy of mainObj1, mainObj2 is created with field2 containing the copied value of field1 and objStr2 is created which contains the copied value of objStr1 So any changes made to objStr1 in mainObj1 will not reflect in mainObj2. The only difference between this approach and the earlier approach is that the clone method in the PupilVO returns a newly created PupilVO object. This ensures that whenever the copy mechanism in initiated, the object SubjectVO also gets changed. Deep copy has an alternative approach - serialization. In serialization, the whole object graph is written into a persistent store and read back when required. So whenever we read the object from the persistent store, the original object is referred. There is no hard and fast rule defined for selecting between shallow copy and deep copy but normally we should keep in mind that if an object has only primitive fields, then obviously we should go for shallow copy, but if the object has references to other objects, then based on the requirement, shallow copy or deep copy should be done. If the references are not updated then there is no point to initiate a deep copy. A lazy copy can be defined as a combination of both shallow copy and deep copy. The mechanism follows a simple approach - at the initial state, shallow copy approach is used. A counter is also used to keep a track on how many objects share the data. When the program wants to modify the original object, it checks whether the object is shared or not. If the object is shared, then the deep copy mechanism is initiated. In shallow copy, only fields of primitive data type are copied while the objects references are not copied. Deep copy involves the copy of primitive data type as well as objet references. There is no hard and fast rule as to when to do shallow copy and when to do a deep copy. Lazy copy is a combination of both of these approaches.